Current industry trends that increasingly contribute key challenges to the successful design and conduct of oncology clinical trials include the following. Increased trial complexity: Protocols are longer and more detailed than ever, which almost directly corresponds to an increased level of eCRF complexity. When it comes to the extended study team, meaning the sponsors and all the vendors, we can no longer expect a single CRO, 1 central lab, and an eDC vendor. Trials today conducted by small to mid-size U.S. drug developers have multiple vendors of 15 or more involved in the trial, and this is becoming the norm rather than the exception. 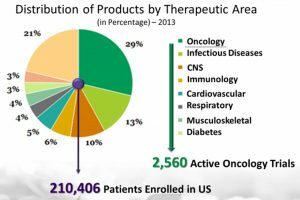 Increased competition: Another key challenge faced by drug developers and their team of vendor partners is increasing competition. This is especially the case in oncology trials, with more molecules and therapies being developed for oncology than for any other indication. The diagram to the left represents the breakdown by indication of industry-sponsored trials. Increased enrollment period and overall study duration: Of all the therapeutic areas the period between the First-Patient-In and the Last-patient-In for oncology trials is the longest. 50% of Phase 3 oncology trials will close early due to insufficient accrual, more precisely due to the lack of timely accrual. A longer enrollment period leads to a longer overall study duration, and higher costs. Increased costs: Oncology trials have the highest per patient fee reported, compared to all other indications. And as we know, monitoring an oncology trial requires CRAs that possess oncology expertise. 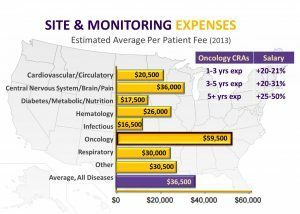 These oncology CRAs are more expensive than CRAs used for any other indication, which in turn increases monitoring costs and the need to carefully select for stable, specialized experience when choosing a CRO with which to partner for your oncology trials. Lower probability of phase transition success for oncology trials: Another important challenge not to be forgotten in the entire equation, and one that is not always apparent, is the probability a program will successfully transition from one phase to the next. 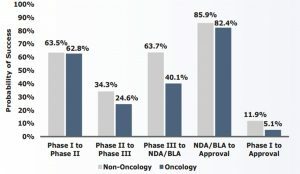 For clinical trials on average this probability is 11-12%, whereas in oncology clinical research this probability of transition diminishes rapidly to 5% for trials that actually make it from Phase I to FDA approval. How Do First-In-Class Sponsors Mitigate Risk and Overcome Industry Challenges? With the rapidly evolving complexity of oncology clinical trials, being first-in-class throughout the drug development process is increasingly critical. There are a number of best practices and key attributes that characterize ‘winning’ sponsors, distinguishing them as first-in-class. 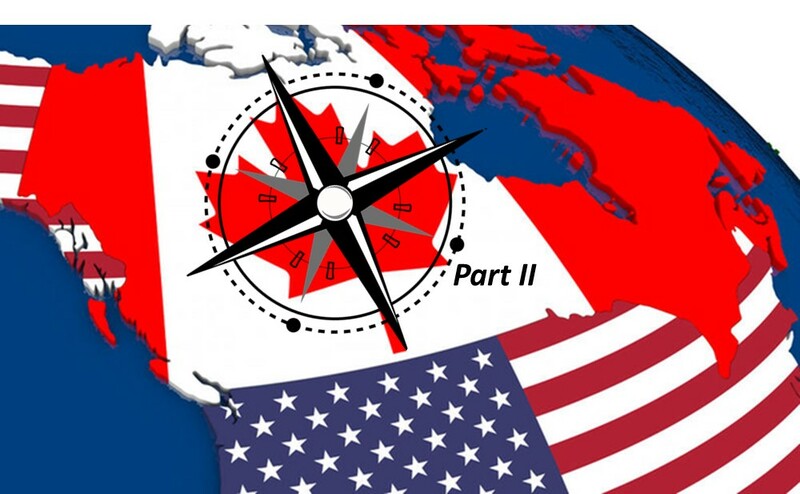 Undertaking and transitioning a study from a phase 1 to a phase 3, means study challenges will arise. Two important considerations that should always remain top-of-mind are: keep things as simple, clear, and straightforward as possible; and leverage the experience gained from the early development phases. Efficiencies can be gained by drawing on resources already in place, and by taking stock of previous lessons learned instead of reinventing the wheel for each trial. Problems encountered with the drug, with the treatment, with some aspect of logistics, are valuable lessons learned. It’s possible to leverage these lessons as the program progresses from one phase to the next in order to prevent reoccurrences of these problems. The same principle applies to study teams and sites. The study teams and sites involved early in the development of the program acquire a deep understanding of the agent and study design. Wherever possible keep this knowledge and experience onboard as you progress into later development phases. There is significant retraining and logistical costs associated with changing the extended team and/or sites involved at each phase of an oncology clinical trial. Despite the challenges, clinical trials remain our best tool to assess the usefulness of oncology treatments, which at the end of the day, brings new therapies to cancer patients. Though it is not the easiest industry to navigate, it is extremely rewarding to be an active contributor on this journey. Collectively we have gained tremendous experience in the field of oncology research, and we are better positioned than ever to try and anticipate and manage pitfalls. This will lead to more reliable studies and we can all draw more enjoyment from designing and conducting oncology trials. Common goals that the first-in-class drug developer and a specialized CRO partner should share are a commitment to: faster results, greater value from everyone involved, and fewer hiccups and costs. In addition to these shared goals, winning sponsors and their specialized, experienced CRO partner(s) also face the very same challenges in the clinical trial process. Some key attributes of first-in-class drug development companies are that they are dynamic, excel in effective communication, have good science, value relationships and engaged vendors, and are keenly interested in investigators and site networks made available to them by their study partners. COMMUNICATION, probably the most important component, is characterized by 2 key areas where operational efficiencies are gained from adopting effective communication strategies with study partners: setting-up productive team meetings, and defining clear roles and responsibilities early at the start if the project. MONITORING OF STUDY PROGRESS is another key area where efficiencies can be gained by the specialized, experienced CRO selected to partner for success with in clinical trials. Defining expectations and deliverables, holding face-to-face kickoff meeting with key team members, and selecting vendors with internal multi-level oversight are some methods leading to the successful conduct of an oncology trial. • bring study-specific added value to the table and is the right fit for the extended study team. • have established key internal processes, such as risk assessment and mitigation. • Promote a collaborative, solution-oriented approach. • Present a clear and comprehensive proposal from the start of the project. – New array of specialized vendors can deliver unique high-quality, specialized services. 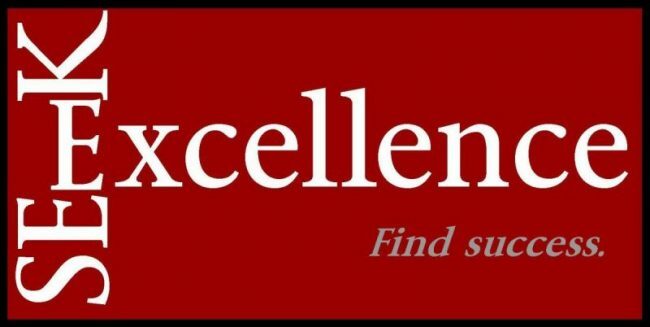 Being a best-in-class sponsor gives you the freedom to explore the opportunities that arise in this demanding and exciting field of study, and partner with those who will be your most effective collaborators. Ultimately, we owe the patients, who agree to participate on our trials, the highest quality research we are capable of providing.